The Venezuelan military has barricaded a bridge at a key border crossing, Colombian officials said Wednesday, in an apparent bid to block humanitarian aid from entering the country. 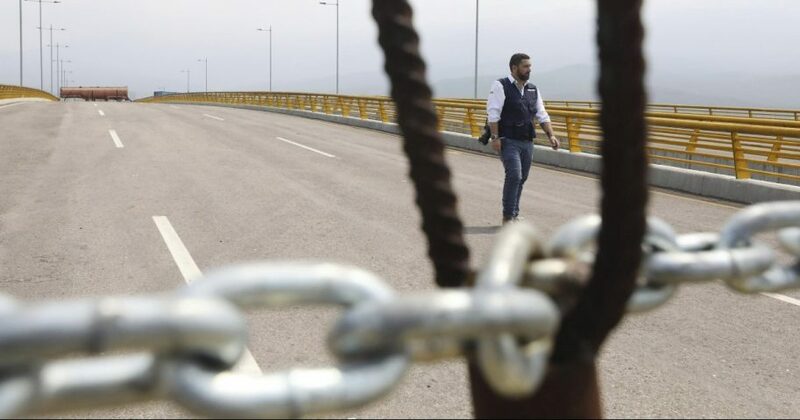 The Tienditas International Bridge was blocked a day prior by the Venezuelan National Guard with a giant orange tanker, two large blue containers and makeshift fencing near the border town of Cucuta in Colombia. The aid squabble is now the latest front in the battle between Guaido and President Nicolas Maduro, who is vowing not to let the supplies enter the country. Maduro argues Venezuela isn’t a nation of “beggars” and has long rejected receiving humanitarian assistance, equating it to foreign intervention. Looking up at the giant containers blocking the bridge Wednesday, aid worker Alba Pereira shook her head and dismissed the barricade as another government ploy. She said that humanitarian volunteers would find a way to get the aid into the country regardless. “It’s a means of intimidation, but I don’t think it will accomplish anything,” said Pereira, director of the nonprofit Entre Dos Tierras, which aids Venezuelans migrants. Should the U.S. military intervene to deliver humanitarian aid to Venezuela? Guaido says the emergency shipment is a “test” for Venezuela’s armed forces, which will have to choose if they allow the much-needed aid to pass, or if they instead obey orders. Soaring hyperinflation has forced millions of Venezuelans to flee or go hungry as they struggle to find or afford basic items like food and medicine. An emphatic U.S. Secretary of State Mike Pompeo said that Venezuelans desperately need the emergency supplies that the U.S. and other countries are preparing to provide. Maduro has clung to power with the support of Venezuela’s highest-ranking military officers. He dismisses Guaido as a puppet of the United States, which he says is seeking to colonize Venezuela and exploit its vast oil resources. Colombia shares a 1,370-mile border with Venezuela and is backing Guaido. The neighboring Andean nation has received over 1 million Venezuelan migrants in the last three years.